In the Egyptian culture, they believe the Nu was the name of the dark swirling chaos before the beginning of time. Atum was a being that came out of the chaos using his thoughts. He created a hill for him to stand on. He was alone in the world. Atum was neither male or female. Atoms had one all seeing eye that could roam the world. 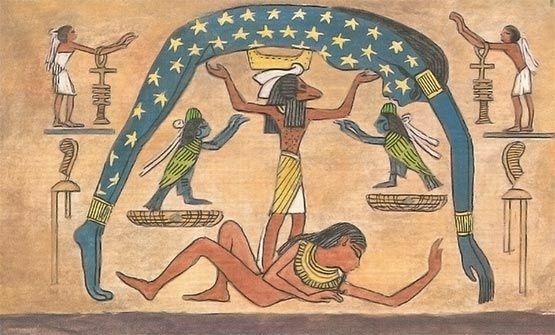 Atum joined with his shadow to create children, a boy and girl. Atum gave birth to his son by spitting him out and his daughter by vomiting her out. He named his son Shu, meaning, “God of Air” and his daughter name was Tefnut, she was the goddess of mist and moisture. Atom told them to separate the chaos into principles of law, order, and stability. It was divided into the light and dark. They called this order Maat. Shu and Tefnut pronounced Geb, the earth and Nut, the sky. At first they were stuck as one. Shu put Nut into the heavens. She would remain arched over Zeb, her mate. Maat has written they had to be apart to complete their destiny, even though they wanted very much to be together. Nut produced rain for Geb, and he made things grow. Shu and Tefnut pronounced other Gods. Isis, the queen of the gods, Hather, the goddess of love and beauty, oriris, god of wisdom and justice, Seth, the god of evil.